Brazilian side Chapecoense have revealed their new away kit will proudly sport the colours of the Colombian flag as a demonstration of their gratitude to the entire country for the love and support the club received in the wake of the tragic plane crash that nearly wiped out their entire team. Chape’s plane went down on it’s approach to Medellin airport ahead of the 2016 Copa Sudamericana final, killing 71 of the 77 people on board. Of course, the final never went ahead, but that didn’t stop tens of thousands of fans flooding to the Atanasio Girardot stadium to pay their respects. 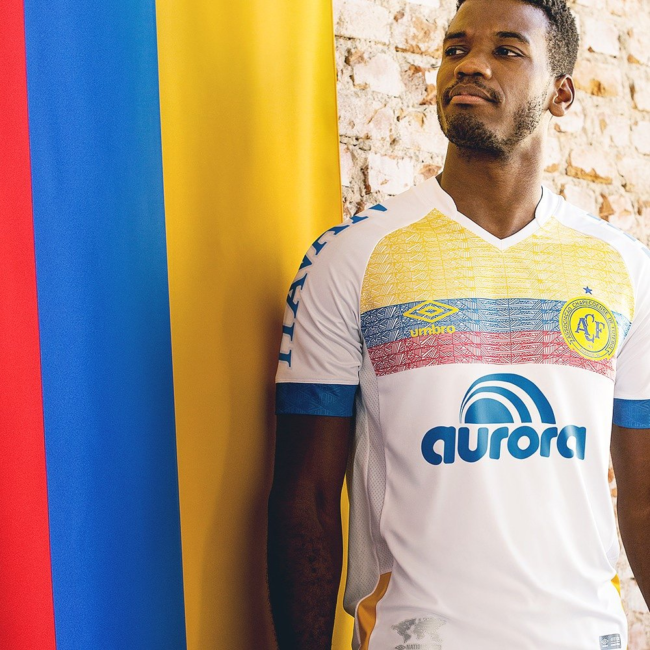 According to the official Umbro blurb, the main white base of the shirt represents the “transmitting of all peace and harmony” while the Colombian colours are just that. Pretty darn lovely, and a bloomin’ handsome shirt to boot. And what does the “Aurora” represent?